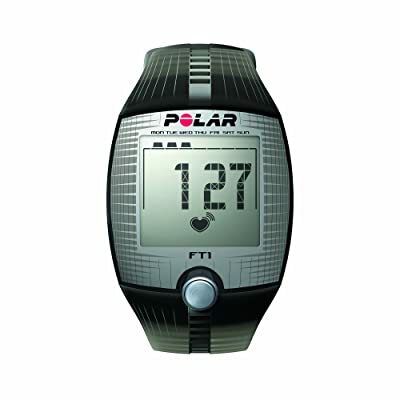 If you are looking for no frill, simple heart rate monitor that does its job well, then you need to look for Polar FT1. It is accurate, simple and easy to use. It contains all the basic features, which are sufficient for anyone who is looking for just heart rate monitor. In the same series, there are two other monitors. You can decide which one suites you better based on this FT Series comparison guide. It comes with Chest Strap fitted with H1 sensor and a wristwatch. In general, chest strap monitors are considered more accurate. It transmits the data from the chest strap to the wristwatch in coded form (Polar OwnCode 5kHz coded transmission), thus avoiding interference from other nearby devices. Continuous heart rate reading: The monitor shows the heart rate reading continuously. Thus, helps you keep track of you training all the time. HeartTouch: This feature helps you see the current time without touching any button. Just bring the watch near the chest strap and the current time is displayed for few seconds, then it goes back to the previous screen. Simple one-button start: The watch is having only one button to access all the functionality. It has its own pros and cons. The benefit is, with single button, you can manage the watch. Just sit with your manual for half an hour and you are good to go. The bad part is, with single button it becomes very tedious to navigate to other functionality. Manual target zones: This feature enables you to define the target zone as you want and is suitable for your training. You can set the target zone for your training as beats per minute (bpm), as a percentage of your maximum heart rate, or as a percentage of your heart rate reserve (HRR%). Audible Alarms: FT1 has zone alarm that will beep when you cross your permissible heart rate limit. Memory: Allows one file to be stored in the memory. Displays your latest workout details. Display: FT1 is famous for its exceptionally larger display. Display text only in English. It contains backlight to view readings in dim dark places. Watch with Time and Alarm: You can see the date and time like a normal watch and can also set alarms. Battery: The battery is not replaceable by user. You need to send device to manufacturer for battery replacements. Water Resistance: FT1 is waterproof, but it is unsafe to operate on the buttons. It has very limited features. The price is also less compared to other models. So, basically it depends on your budget. This is a entry level model in the Polar line of products. It is accurate, very easy to use and have all the basic functionalities. It does the job very well if you are looking for basic heart rate monitor, which display your heart readings, no frills attached. However, if you are looking for additional features, then you can look for Polar FT4 or Polar FT7.